Many people travel a lot either for leisure or business. Because of this, the travel industry is now a serious business. However, not all who are engaged in the travel business succeed. One of the primary reasons they failed is because of their poorly developed websites. It is a must that if you have a travel or tourism related website, you need to have an inspiring and effective website. And these are made possible by top travel website templates listed below. There are lots at stake to make sure that your website will look great and offers the best user experience for potential travelers and tourists who might be checking your location in the future. Every business owner knows that travel industry depends on trust. Word of mouth and marketing is the best tool to help you succeed if you are into business or pleasure trips. This means that your website should use a theme that offers key features like smart booking plugins for hospitality sites, the best navigation features for better viewing experience and a great display of videos and images. People would easily trust a website that looks reliable, easy to use and comprehensive. It is important that your website reflects professionalism. Keep in mind, the client’s first impressions will create a big impact when it is made online. For a tech-savvy person, creating an impressive travel page is easy. But, for those who are less knowledgeable may require the service of a third-party company to build their website. To avoid the added cost, you can buy a travel website template. These online kits are complete that will help you enhance your website in every aspect. They provide both aesthetic and functional improvements, and easy to use. Here are some of the best travel website templates you can consider. This marvelous template is made for those people who adore winter tourism. It draws the attention from the first seconds. To begin with, it includes a fully-responsive design that quickly adapts to multiple screen sizes. It also has a superb look that will attract more and more readers to the website. Thanks to snowing animation effects, each visitor is going to agape with wonder looking at your online-project. Different header and footer variations also give your website some attractive visual tricks. There are also six homepage layouts that make a process of the website building even quicker. The same thing can be said about 40 ready-made pages. Counters and other exciting animations work extremely smoothly. They also have nothing to do with a speed of the website loading. There are more features that should be mentioned. Sun Travel is fully editable travel website template recommended for travel agency websites. This will help your business generate more traffic. It is a well-documented travel theme with the high-quality layout and assures productivity. The kit makes it easy for you to build versatile layouts on the fly. You can choose from 45 pre-designed pages and several blog layouts to build a professional website for your clients’ satisfaction. 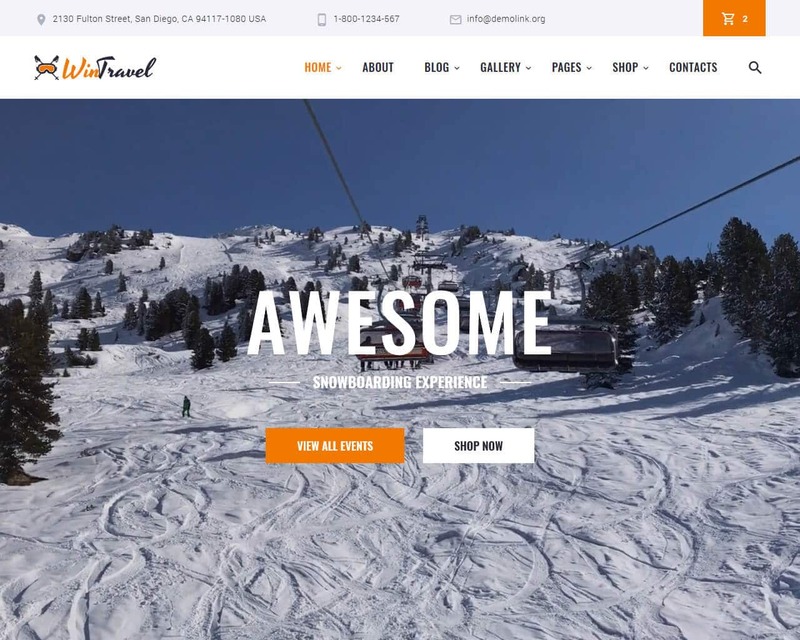 If you are looking for modern, clean, and innovative travel agency website template, the Sun travel is highly recommended. Building your website that can be viewed in any type of device and any screen size is fast and easy with this template. This travel template is fast, mobile-friendly with the latest custom-built visual drag-and-drop editor that is easy to use. You can build a professional industry-optimized design where you can create new pages in a snap. Adding elements to the media library is very easy. Setting positions and adding button styling and a lot more is fast and easy. Your business will be one step ahead of your competitors with the help of this template. 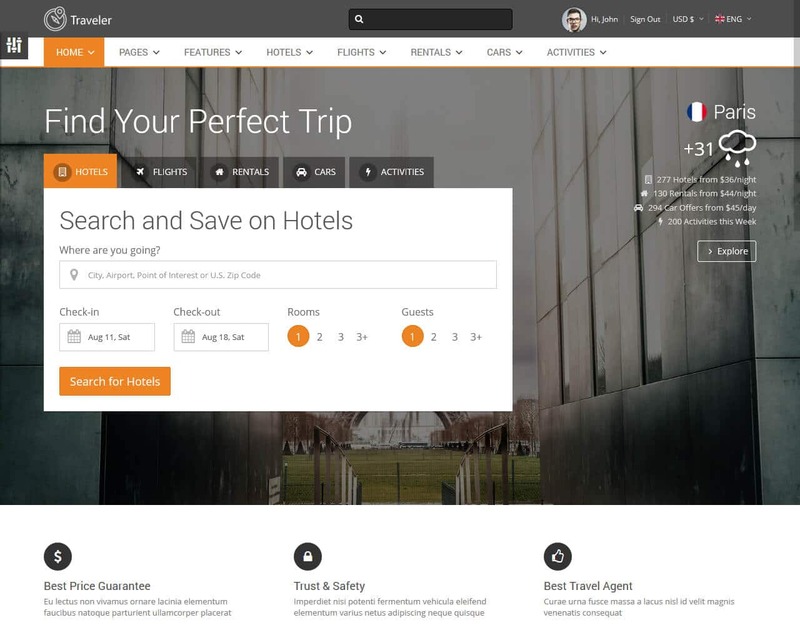 Travel Booking website template is a clean and contemporary template that is your best companion for your adventures. It features different post types and is very flexible. The template is complete and has everything you need to help your customers book their next trip. 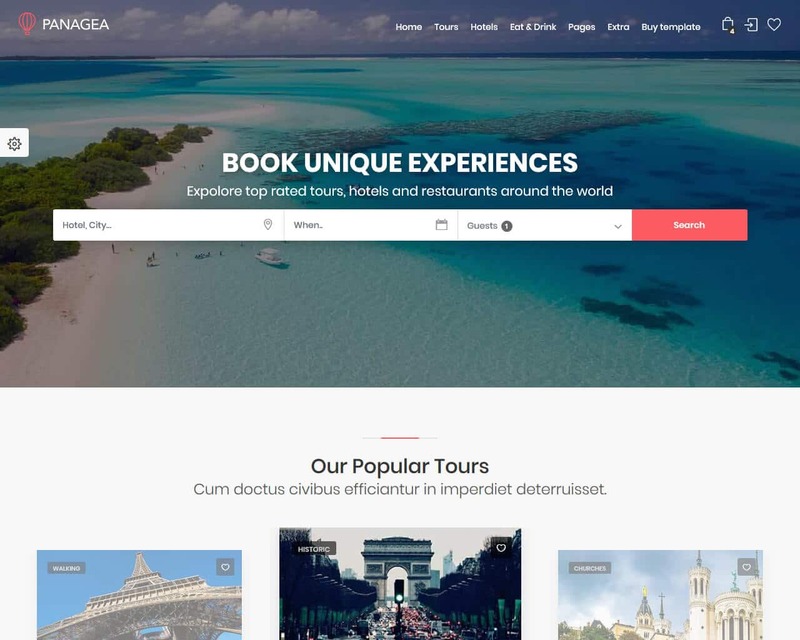 A multipurpose multipage site and one of the best tour and travel template that will help you build a website designed with a great attention to detail. This template lets you create an effective travel booking website to offer trains, cab, flights, hotels bookings fast. This template is suitable for agencies and companies that offer all services associated to tourism like resorts, events, listing packages, hotels, package tours, cruise, tour operator, flight tickets, hotels directory, retreat and wellness, and a lot more. The Travel Booking website template is designed to engage visitors and guide them on their next move. The theme includes about page, booking page, home page, gallery page, and a contact page where you can find all the information you need when traveling. In the home page, you will find the tour packages section, where you can showcase your best travel packages. You can display your best travel package offers. The Travel Agency is a template which provides a fully featured travel website. Some of the great features include smooth user experience, cross-browser compatibility, cutting-edge visual effects, online chat, drop-down menu, tooltips, fully responsive, favicon, live search, tabs, back-to-top button, Google map, extra pages layouts, sliced PSD, and others. Designed in compliance with the newest web design trends, it provides a smooth user experience and innovative features. For instance, you can add a looped video on the background of the homepage and is used as a helpful attention-grabber. This template is complete with a standard set of pages with different blogs, header and footer positions, gallery layouts, and a lot more. It is rich with search forms and well-designed reservation. You can view the website in any kind of device and enables your site to adjust easily to any screen size. You can choose from more than 500 Google web fonts to easily customize your website and adjust the design according to your specifications. Are you in search for an impressive template to use for your website? Panagea is a good choice since it provides you full details and downloads links associated to travel themes. This template is compatible for any browser and the layout can be viewed easily on any device. There are lots of features that you can use to help you in designing your website. You can download Panagea for free. To help you on how to build the website, it is best to use the demo first before you use the actual template. This website is modern and clean perfect for agencies and companies that offer services for tourist. It can be used to offer general attractions information, search and book hotels, buy tours, and other associated with traveling. The template is designed and built keeping in mind the last web design trends and mobile device use first. It has four premade color schemes, or you can add your preferred color easily. 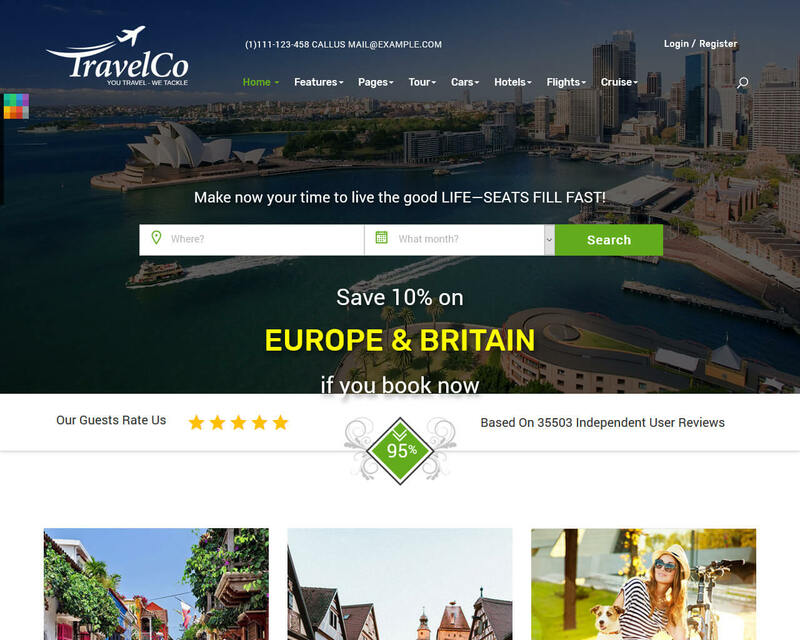 The Travel Co is a great travel website template with the elegant and clean design. The template has a nice color switcher that is very helpful in creating your website. It is well-designed and built for tour operators, travel agency, tourism development and other related travel services. Companies and agencies that offer services like car rental, course, hotel, tour, and flight can use the template. It offers lots of color skins and unlimited layout possibilities. Travel Co has 65 pre-defined pages, twelve color schemes, seven homepage version, mega menu integrated, 28 PSD files included, e-commerce ready, dashboard pages, and a lot more. It can be accessed easily on any device and any screen type. The images are displayed clearly even on your smartphones and other small devices. Navigating the website is easy and fast. Your customers will not have any issue viewing your website. Are you into travel business, agent or agency and in search for tour and travel template? The TravelAir website template is the best choice for your travel packages and tour website. It is a clean and attractive website template that includes the latest design. The template must provide your customer to have the best experience to easily access your travel business online with your business information such as booking query online, traveling packages, contact information and the top destination. This template is designed and recommended for the agency, tourist business, travel insurance, holiday planner, tour packages, travel guide, international and domestic tour provider and others related to traveling. The layout of your design can be viewed clearly on any device like iPad, Android, and iPhone. Other features include owl carousel, font awesome icon, Google fonts, cross-browser compatibility and a lot more. It has a unique and creative homepage design with modern style design layout. A section for a tour package, about us, and top destination can be found on the homepage. Your Travel World is a travel-themed template. It is the perfect solution for all of your travel associated website to boost your profits and expand your business online with the use of the smart and impressively designed template. This creative and modern design template is recommended for businesses like hotels, events, cruise, tour operator, medical tours, wellness and spa, adventure shops, lifestyle, music, leisure parks, fast food chains, car rental, adventure parks and a lot more. This intelligently built template has great features like entrancing video background plugin, mesmerizing parallax effect, gallery lightbox effect, countdown timer, impressive style of design, smooth scrolling navigation, banner text slider, booking reservation form elegantly designed, carousel slider, countdown timer, and others. You can view the website on any device and any screen size and resolution without a problem. It is built in Bootstrap framework and JQuery. Check it out now and create your travel website fast and easy. 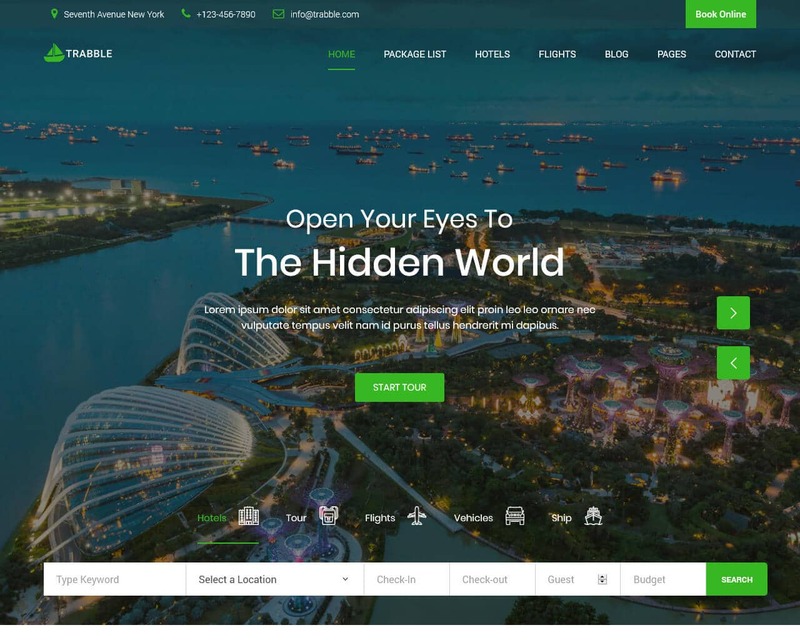 The Trabble is a travel agency website template that lets you easily and effectively create your travel booking website to provide car, cruise bookings, flight and hotel in minutes. You will have a travel agency website fast and very effective in attracting more customers. It has a clean, modern, and attractive design with smooth transition effects. The files are well-organized, and the contents are SEO optimized to increase traffic. The template has integrated Google maps, Google fonts, also included are blog page and post page, font awesome icons, cross-browser compatible and others. This template can help you create the most impressive website with unique sections, custom image slider and is viewable on any device. Customizing it is easy, just add all the details and the Trabble will do the rest. You can add other sections you want to include to create an impressive website that will stand out from the rest. This template is designed for adventure parks, travel agencies, and tourism and tour companies. The website can be viewed in a different device and looks impressive on all types of devices and screens. Well designed and is easy to customize. The FZ Tour and Travel is the best way to present your modern business. This travel agency business is very different from others. For various types of businesses having a website is important, but for travel or tourism agency it is not just vital, it’s a must. It is the easiest way to reach people from different parts of the world and offer your services. 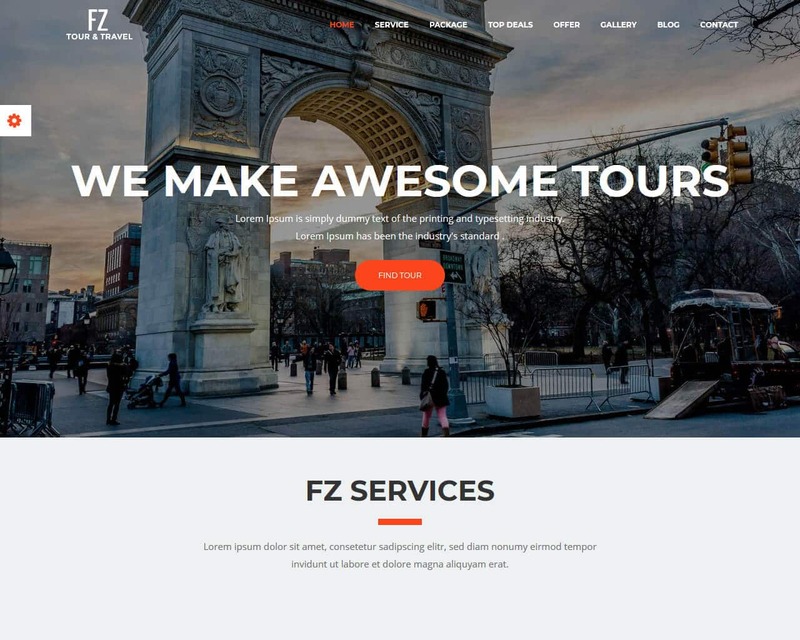 The FZ Tour and Travel template will give your website an outstanding look with different features. You can choose one from 8 backgrounds for your own company. This template is the best way to present your modern business. You will not regret using FZ Tour and Travel since it has all the features you need to present your website and company. Cruise Travel template is a minimalistic and simple template design for a travel agency, travel blog, and tour operator. It is the best choice for all services associated with tourism like a honeymoon, travel, hotels, resorts, cruise, and a lot more. It has an attractive video background and a smooth scrolling makes it easy for your visitors to check out every detail. You can easily view the website on all devices and is compatible with all screen sizes. This is a fresh free traveling template. You can easily add traveling tips on it and is known to have the best quality. 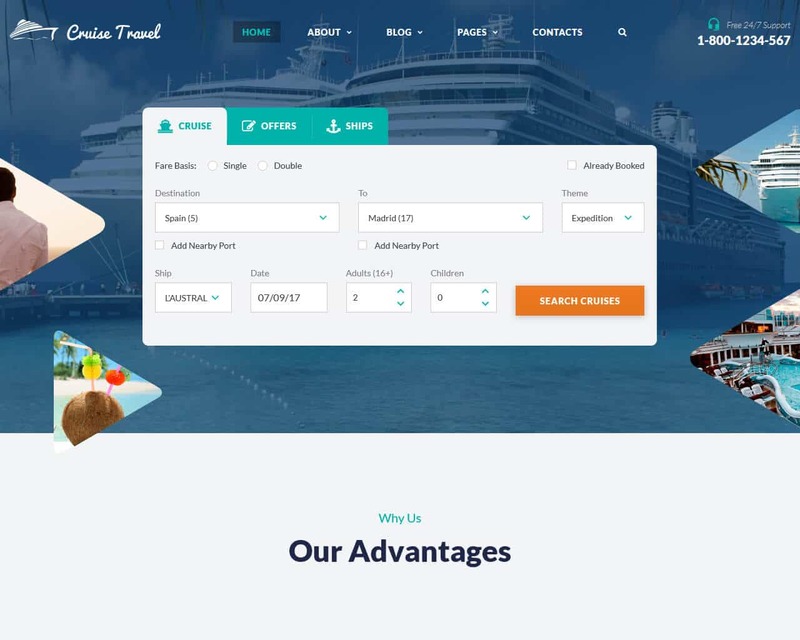 Cruise Travel main objective is to provide travel businesses everything they need to develop a well-designed and fully functioning online website. This will help you promote your agency, promote great destinations around the world, sell tours online, and this Cruise theme is complete enough to fully customize your website. 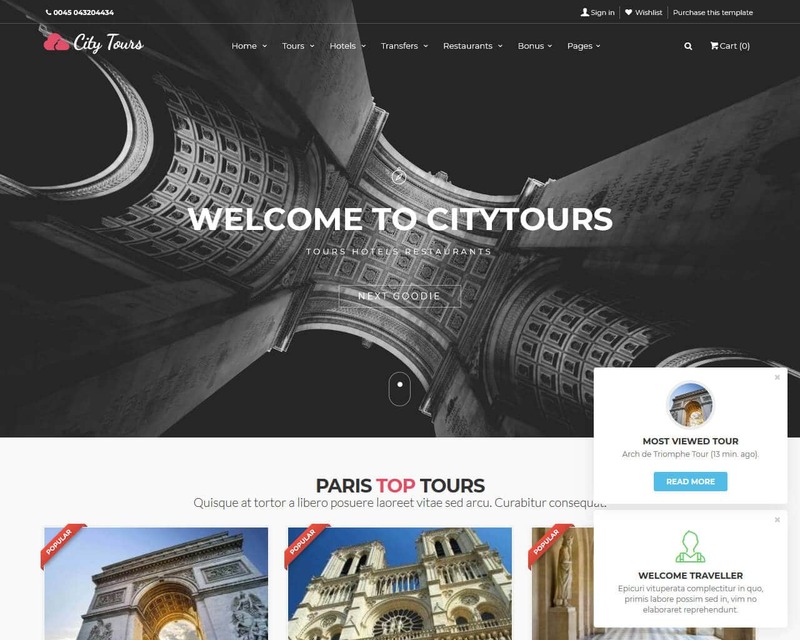 The City Tours is yet another amazing item when it comes to travel website template. It is complete and can provide everything you need when it comes to creating a travel agency website. If you want to offer ticket sales, tours, hotels, local landmarks, and transfers to your clients you will not have a problem adding them on your website. It has eleven homepages, seven different footer variations, four gorgeous color schemes, seven beautiful header types and a lot more. This template has 2000 amazing icon fonts, and each of them is compatible on any devices and resolutions because of its Retina Displays. You will not have a problem assessing the website from desktop computers, laptops, smartphones, and tablets. Other features include Twitter feed plugin, a weather forecast widget, Google map with infobox and multiple markers, booking form with autoresponder and a lot more. Accessing it on all major browsers is not a problem at all because of its impressive design. Sky Booking is a well-crafted template intended for tour booking companies, tour management firms, tour agencies, other businesses that are related to tours, vacations, arranging trips, and different tourism activities online. The template is equipped with a ready-made booking form that can be used in booking hotel rooms, renting cars and of course booking flights. In building your website using this template all you need to do is to add the information and the Sky Booking will do the rest. It comes with over 35 ready-made pages that include all the possible usages of the theme. 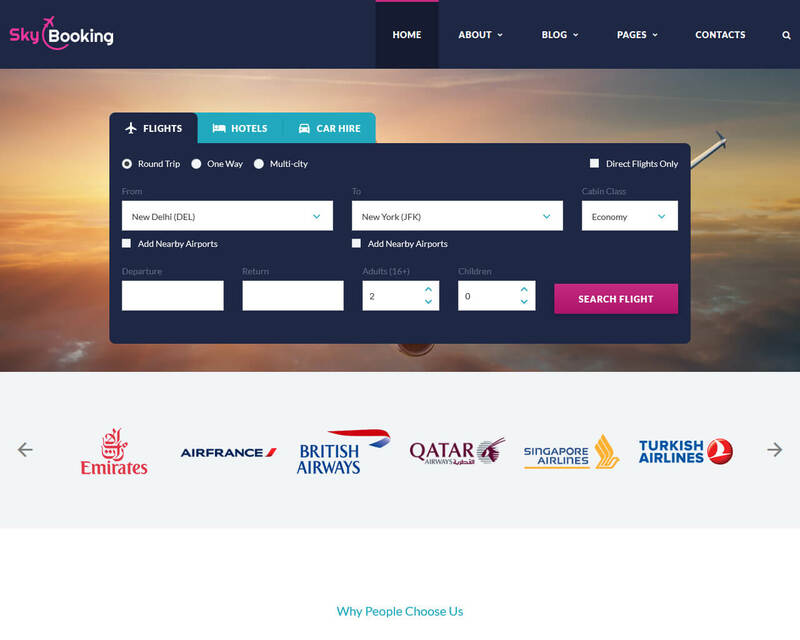 If you are in search for modern, clean and innovative Travel agency website template, the Sky Booking is a good choice. 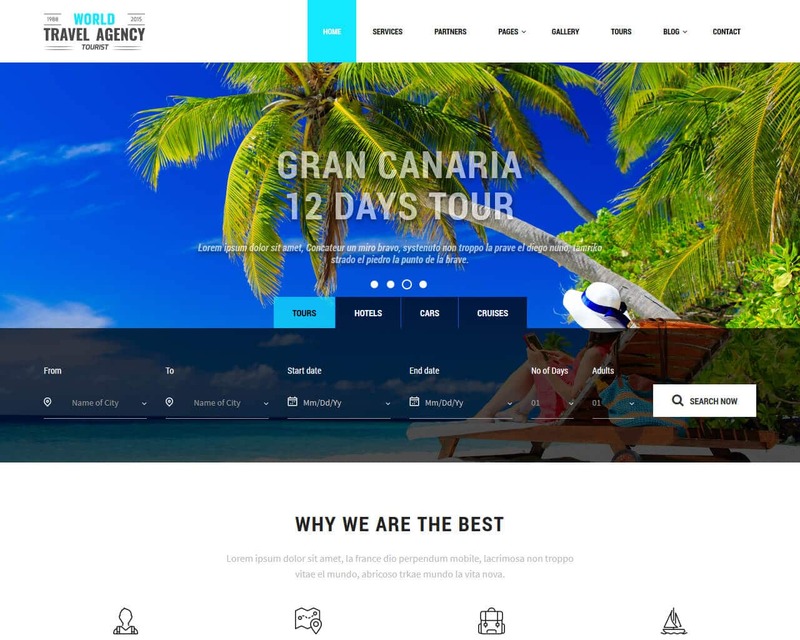 So, it does not matter how your travel agency website will be structured and coded you will have an impressive website with this template. The template includes different types of image galleries, FAQs, coming soon pages, 6 blog layouts, testimonials, maintenance, 404, and a lot more. You can view the website in any devices, from smartphones to retina screens. Bookify is a rich and complete template ready for any integration. It is based on research of popular booking providers such as Airbnb, priceline, kayak, booking.com, Travelocity, Expedia and others. Template is very focused on overall user experience and accessibility. The structure and website are coded and developed in logical way. The website is friendly and optimized for various devices. With regards to other features, there are lots of possibilities being offered. 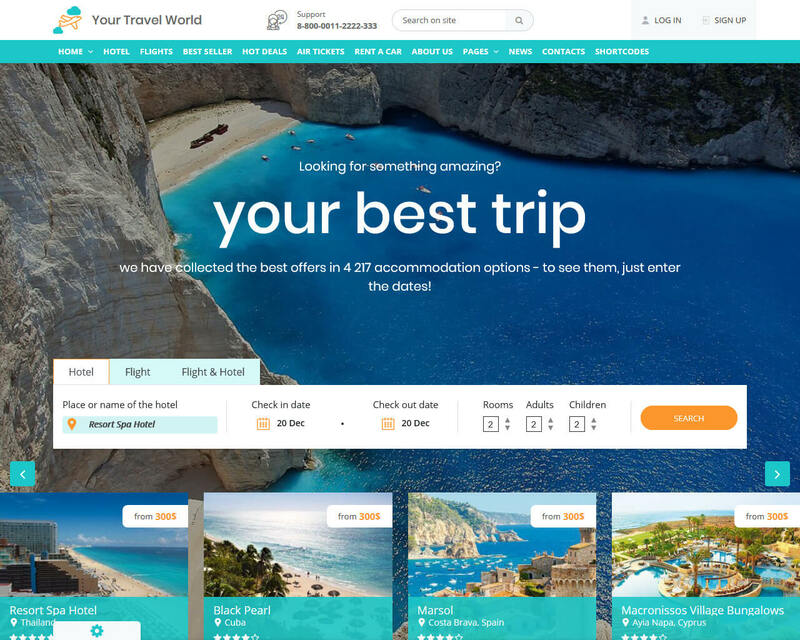 You can choose from 30 plus homepages like general booking ten homepages, flights, experiences, hotel booking, countries, vacation rentals booking, and cities. With over 100 plus templates you have numerous possibilities for expressing your project. Just like other templates it can be accessed clearly on any device and resolutions. If you are in search of the best template for your travel business, the TravelExpress is a good choice. It will provide you with all the details you need, and you can download links associated to this travel theme. This template is compatible in any browser. You can use if your business is into booking, traveling, hotels, cars, and others associated to travel. The TravelExpress has all the impressive features most travel website is looking for. Your visitors can access the about us page, the booking form, and other pages without any difficulty. For travel adventurers and enthusiasts, TravelExpress is one template that can help you with your project idea. 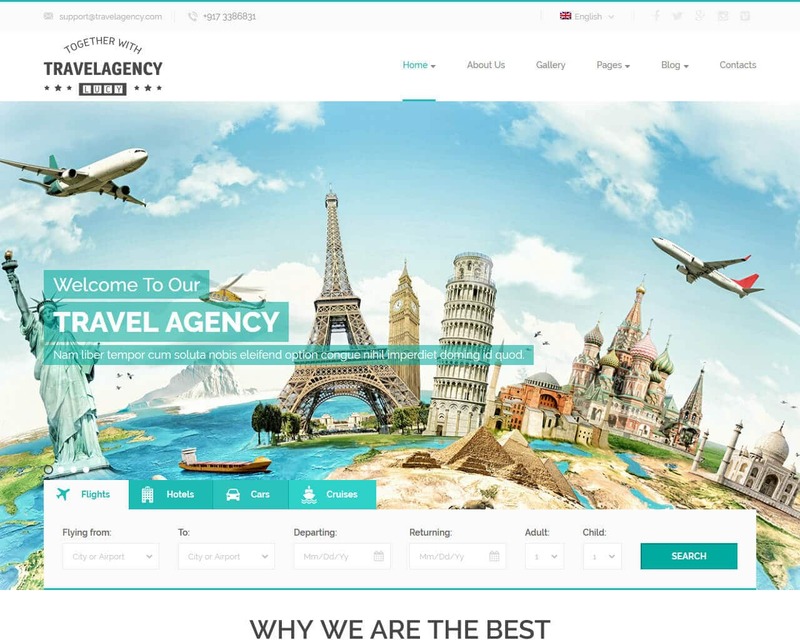 It is a travel agency website template by default but it can do more for you. 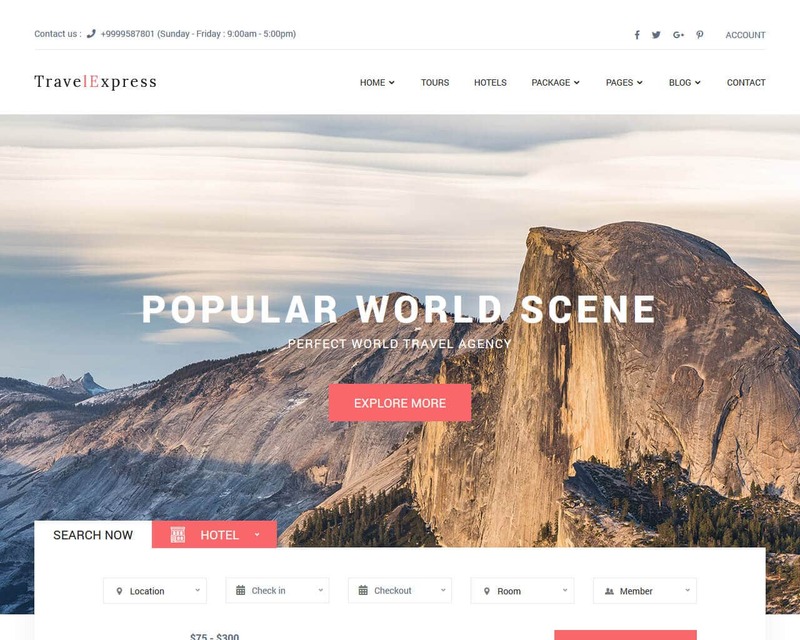 TravelExpress has two lovely blog styles which you can use as a standalone page. It has an elegant and trendy design which makes using it and creating a website a breeze. There is no need for you to enroll in a course or study to create your website. Just add all the information and the TravelExpress will do the rest. Trip advisor website template is a sleek, modern and clean solution for various purposes such as spa, tourism, resorts, vacation, and others. It can be viewed in any devices and in any screen size. The template is compatible in any browsers. Your visitors will not have any difficulties accessing and navigating the website since it has easy-to-follow navigation. Customizing the website is easy, all you need to do is to change the fonts, colors or other elements of the template using the admin panel. Trip Advisor is designed with valid code and the template has the following great features – mobile menu, SuperFish DropDown Menu, Google web fonts, ScrollPane, sliced PSD, Google map, Scroll effect, Favicon and other useful features to help you develop a seamless website. 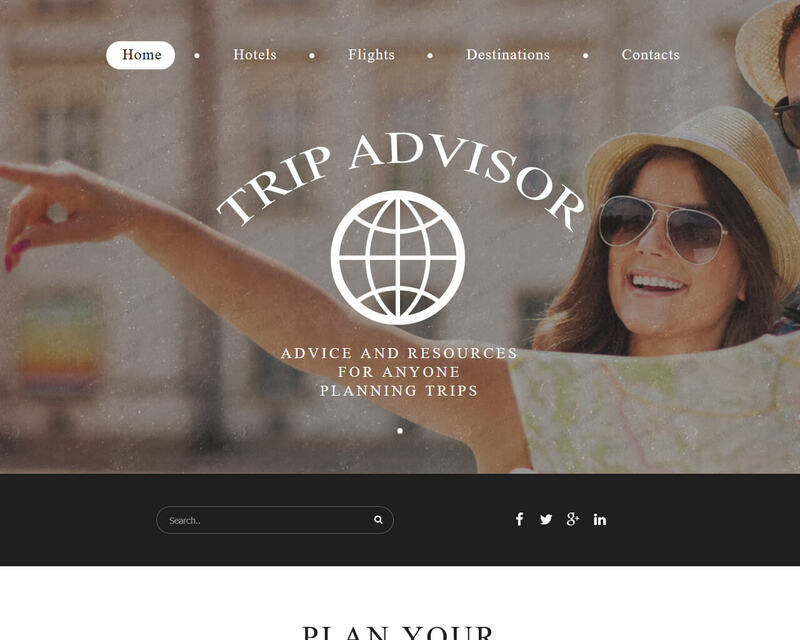 Trip Advisor template has striking design and style that are important in building an impressive website. Take advantage of its great template for a tour or trip guide to boost your website traffic and create an enticing one. Camping website template is of the best templates for those who are planning to build a website for their camping facility. The design is integrated with the parallax effect to ensure the best user experience. With this template, you will get an impressive looking website. It is developed with lots of sophisticated features to provide all the needs of most websites regarding hiking, adventure, fishing, holiday trip, mountain, nature walk, ski, fishing, hunting, outdoors, vacation, backpacking, resort, biking, traveling, park and other websites. Its attractive interface and user-friendly layout will provide that you need for your travel websites. Camping website template is coded well thus it is very flexible and can be viewed clearly on any device and screen resolution. It works perfectly on all operating system and is compatible with all browsers. Easy to customize. You can choose the fonts, colors, and design for your layout. It is optimized for clearer display. Traveler is a simple, modern website template particularly for Travel Company. It is built with the newest technology for web development. The template includes price table, about us section, carousel banner, and gallery. Traveler website template is recommended for tour operator, travel agency, travel blog and any business website. The website created using the template is very compatible to all devices. It is perfect for all browser and search engine. 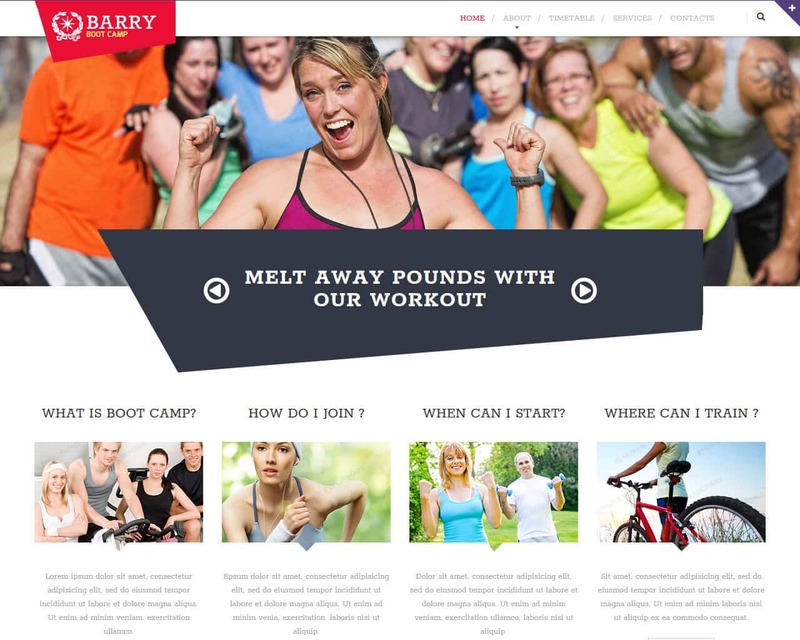 This multipurpose theme can create the best website with all the information on it. Your visitors will be amazed on how your website looks and how easy it is to navigate. You can customize it by changing the color, fonts and add everything you need on it. Traveler is a package complete with all original files, working photo gallery, all pages in psd format, and contact form. The website is easy to navigate, and your visitors will not have any problem using it. This template is ideal for travel booking website, designed and optimized for travel companies. It has 17 unique homepages, more than 100 pages, availability checker, front-end management, availability checker, completely integrated booking system, review system and a lot more. 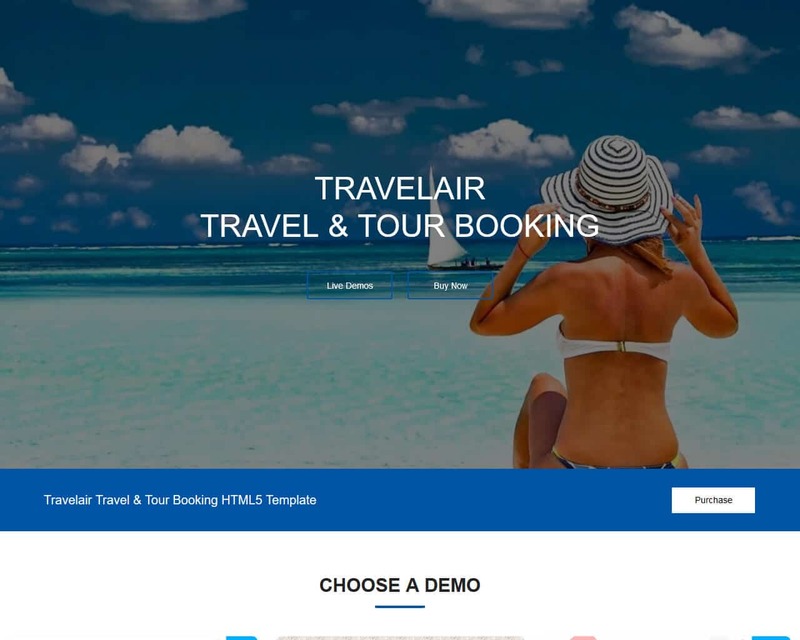 Let’s Travel is a multi-purpose travel booking website template that enables you to easily and efficiently develop your travel website, so your customers can book their flights, cruise, hotel, and car in minutes. It is designed specifically for tour operators, travel agencies, car hire services and others related to tourism. 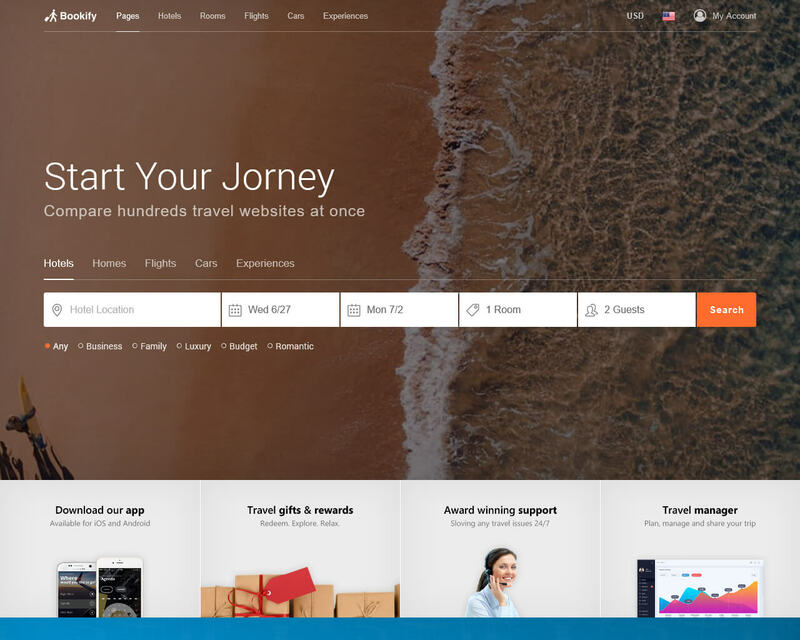 Let’s Travel template is a fully translatable theme that boasts features like powerful and well-integrated booking system, advanced filtering, review system, an availability checker, front-end management for partners and much more. 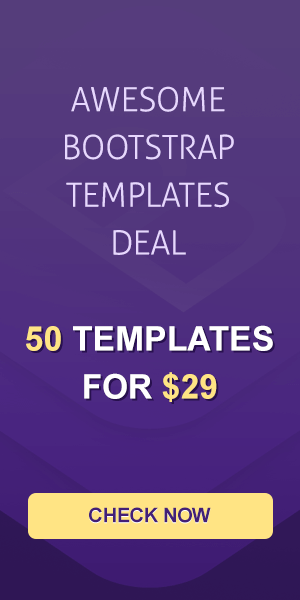 It includes 17 unique homepages, with over 30 shortcodes and more than 100 pages. You can easily view the website in any device and resolutions. Navigating the website is not a problem for your visitors since it is designed and customized well. 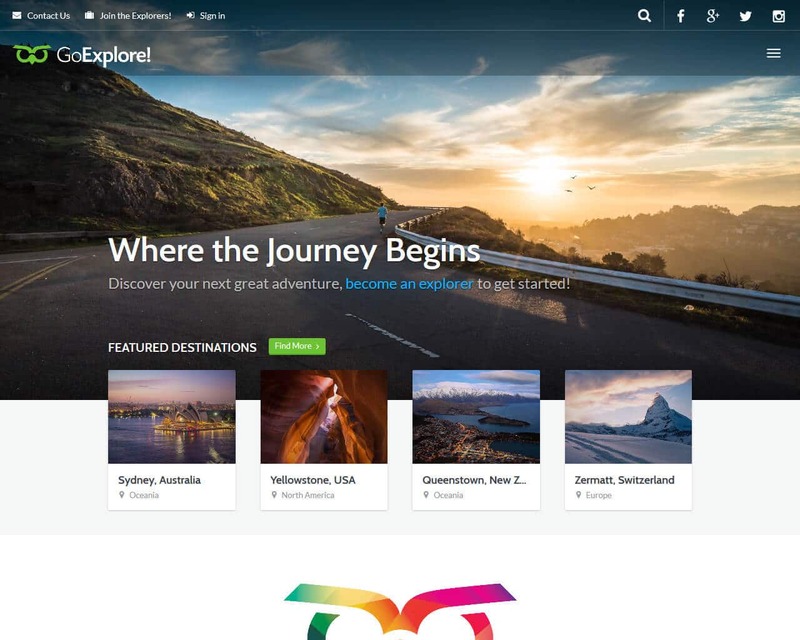 Creating your travel agency, blog, destination, or blog website is fast and easy with GoExplore travel template. It can handle any travel website, a world travel guide or a personal travel blog. Convert your site into a community with lots of contributors, or if you want just you. Customizing is not a problem since it includes tools that will help you do it. You can add a directory to build resources like restaurants, tours, flights and other travel needs. Develop a website your visitors will love and easy for them to use. You will not have a hard time setting the destinations you want to offer to your visitors. A traditional concept can be created like the country, region, and others. Or if you want it customized like adding the places your clients can visit in certain countries. You can easily add these things to your website using the GoExplore template. If you are looking for a clean, professional, and flat travel category template for tourist planners and travel agencies. It includes a free flat responsive web template. This template is designed on Bootstrap Responsive design. 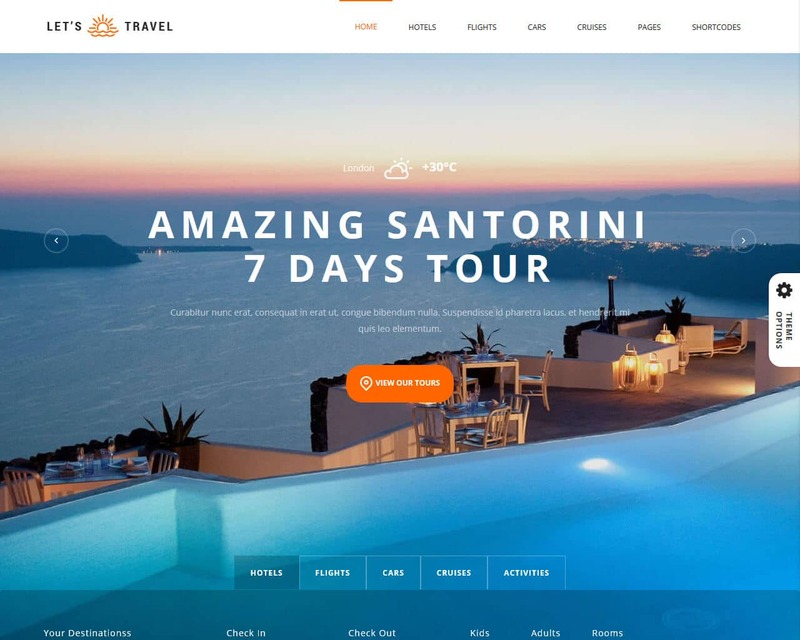 Travelo one-page travel web template is designed in a fancy style, but it can be customized depending on the user requirements. The template is designed with great color scheme and amazing grid style of elements. It is compatible in any devices like tablets, smartphones, and web. For domestic or international travel website, the Travelo is a one-page cross-browser responsive template. 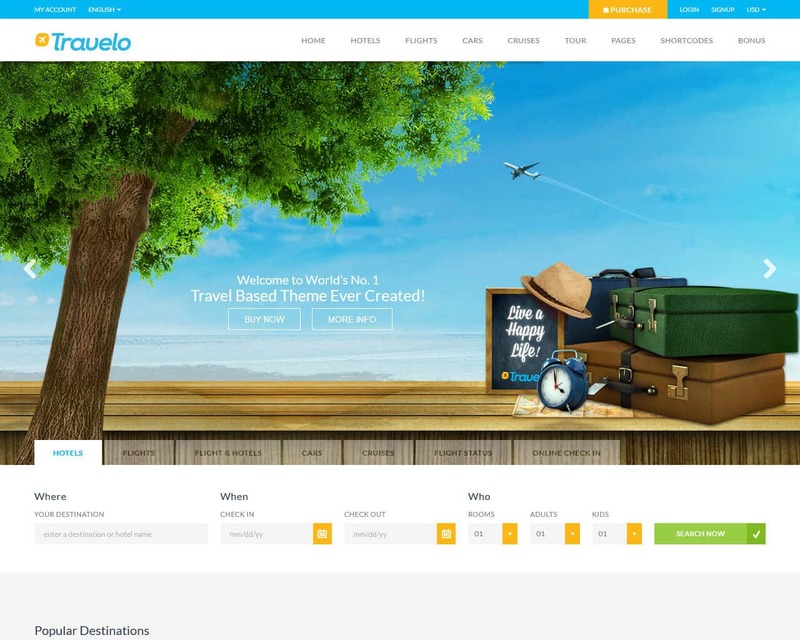 Travelo is the hottest travel website template perfect for car rental, cruise, hotel, tour or travel website agency web page. The template includes a special search box function for flight, hotel, car, and cruise sections. Also, there are eight different header styles, 10 color skins, 2 premium slider plugins, and seven-footer layouts. The template incorporates a grid system that was built specifically for the devices with smaller screens.